For decades, the causes and impacts of climate change have become clearer, but can individual households engage this global challenge? The Mustard Seed community is gathering on November 29th to show our support for taking action to improve our environment. The Mustard Seed Co-op is built by people working together to strengthening our local food system. By doing so, our members are taking action on improving our health, economy, environment, and community. We all make daily food-related choices, so every decision about what we eat can contribute to a more sustainable environment and diverse local economy. Our modern globalized food system is implicated in climate change in many ways, but three areas specifically highlight how localizing our food choices can have a positive impact on this problem. Reducing consumption of scarce natural resources. The ability to grow or find food locally has historically been a prime factor in determining the suitability of a place for human habitation. Yet as technology and global economies have expanded our ability to cheaply relocate food, we are now quite detached from our food sources. When we localize our food choices, we start to re-acquaint ourselves with how rainfall, temperature, and other environmental conditions impact our food supply. The multi-year drought conditions in California have created massive water shortages, yet agricultural production for export continues to drive the majority of the state’s water consumption…so every time we buy Californian lettuce or strawberries, we’re contributing to the unsustainable depletion of their water supply. Ability to impact legislation and policy. Our food choices can impact environmental issues like chemical use or greenhouse gas emissions. When we chose local products, they fall under legislative jurisdictions we can democratically influence. A recent example is Ontario’s restriction on the use of neonicotinoids in order to protect honeybee populations – a policy change driven by public pressure and scientific evidence. We have no control over the environmental policies or legislation of foreign countries, but prioritizing local food means our personal choices have a global impact. Focus on quality rather than volume. When we prioritize abundant cheap food above other values, we contribute to the depletion of non-renewable resources. Our environment bears the externalized costs of fossil-fueled chemical production and trans-global shipping. Local food is picked fresh so it’s stored less and cuts food miles. Those $2.99 melons shipped from Argentina in February come at a cost – not only do they travel thousands of miles, their taste, freshness, and quality leave much to be desired. Ontario apples are a much more sustainable choice. The Mustard Seed’s members are taking action on climate change by choosing local food. We’re reducing food miles – for example, our peanuts are from Norfolk County, instead of Georgia. We’re supporting smaller-scale and organic farmers in our neighbourhood, our region, and throughout Ontario. We’re promoting active transportation, car-sharing, and reducing waste. And we’re encouraging our community to work together in new ways to heal our environment. 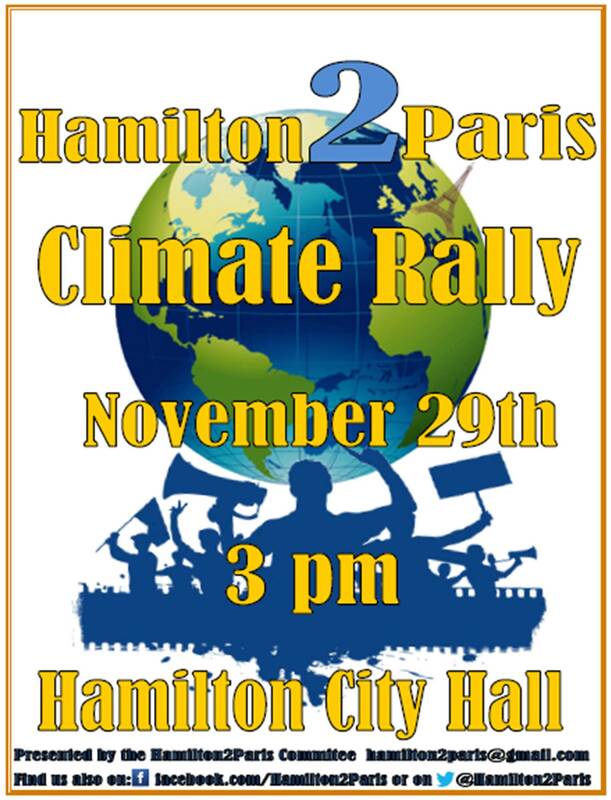 Climate change is affecting us all, so please join Mustard Seed members and friends on November 29th for the Hamilton2Paris climate rally. Wear something yellow and meet at the Co-op at 2:00 to march together to City Hall. Let’s encourage our governments and world leaders to make meaningful commitments to ensure our communities – both local and global – have an environment we can call home. Follow these links for more information on Hamilton2Paris and the COP21 conference in Paris.